Posted January 17, 2018 by admin & filed under Uncategorized. Your vehicle’s transmission is responsible for adapting speed and torque, deftly shifting gears to ensure that the right amount of power is going to the right place and your wheels can rotate properly to make forward propulsion possible. Since it’s such a vital component and is used with great regularity, your vehicle’s transmission can sometimes encounter issues arising from problems in other areas. One surprising element that can dramatically impact a vehicle’s transmission is engine coolant. While you’re driving, your vehicle’s engine heats up and so does the transmission. The fluid responsible for cooling your transmission flows through the radiator. If everything is working smoothly in your engine’s cooling system, the fluid will pass over your transmission cooler within the radiator which allows excess transmission heat to be transferred to the liquid and then couriered out of the vehicle into the air. 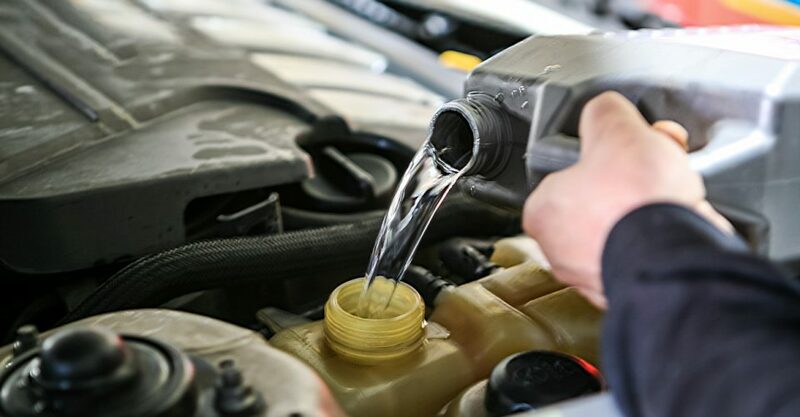 Unfortunately, when your coolant level gets too low it isn’t able to properly execute this process and your transmission can overheat which may lead to expanding parts and excess pressure. This mounting pressure can push your engine’s motor oil beyond an expanding front seal which creates a significant leak, which will seal when the unit cools down but then expand again when heat is reintroduced to the affected area. This is just one example how a problem with a seemingly-unrelated vehicle component can cause problems for your transmission. If you have any questions about what preventative steps you can take to ensure your transmission’s long-term health, be sure to give us a call at 620-654-3445!